Thoroughly revised coverage of research conforms to new MLA guidelines and gives special attention to electronic research and online citations. “Myths about Sources” in each pattern of development section dispel common misconceptions students have about using sources. A Focus on Writing Strategies: Through writing strategies, students are given extensive support at every stage of the writing process. Students are shown a variety strategies for selecting topics, identifying audience and purpose, generating ideas, and revising. They are encouraged to sample some or all of them as they work to improve their writing processes. Additionally, students are given suggestions for securing feedback from reliable readers. An Emphasis on Revision: “The Student Writer at Work" sections provide strategies for evaluating drafts and making changes. These sections help students understand the importance of revision, and they offer specific tools for revision. Guidelines for giving and receiving reliable feedback on their drafts help students build peer response into their revision processes. Substantial Coverage of Argument: A focus on issues and claims helps students write sound thesis statements for argumentation. A detailed discussion of kinds of persuasive purposes helps students establish reasonable goals for their argument papers. A detailed discussion of kinds of audiences helps students gear their supporting details to the level of resistance their claim is likely to meet. Explanations of logical, emotional, and ethical appeals and combining patterns of development help students address their audiences and argue their claims effectively. A full-color casebook of images—advertisements, news photographs, cartoons, and diagrams— offers students insight into the ways arguments can be made in visual form. 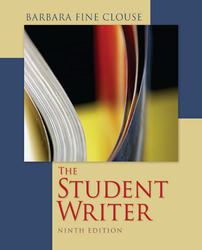 Three student essays, one that includes source material, illustrate effective argumentation. Coverage of Avoiding Plagiarism: “Being a Responsible Writer” sections discuss ethical concerns associated with writing in the major patterns of development. "Using Sources for a Purpose" boxes include help on avoiding plagiarism. Plagiarism also receives a new emphasis in the revised research chapters, particularly issues of electronic plagiarism. Emphasis on Writing outside the Classroom: Each Part 2 chapter includes within its opening section discussion highlighting ways to use the various patterns of development beyond the writing classroom: across the curriculum, in the workplace, and in daily life. Coverage of Visual Arguments: A full-color casebook of images—advertisements, news photographs, cartoons, and diagrams—offers students insight into the ways arguments can be made in visual form. Coverage of Essay Exams: Chapter 16 has been expanded to include process guidelines for writing essay examination answers, strategies for reducing anxiety, and a sample answer for study. Why Is Process Analysis Important? Why Is Cause-and-Effect Analysis Important? Why Are Classification and Division Important? Why Is Combining Patterns Important? Cheryl Sateri	“What’s for Lunch? Fast Food in the Public Schools"
Julie Cooper, "Genetically Modified Food: Watching What We Eat"
Michael Hambuchen	“Symbol and Theme in ‘Coca Cola and Coca Frio’"